$25 Hobby Lobby Giftcard Giveaway!!! What’s one of the best places to score awesome craft supplies, fabric, home décor…furniture…pictures….frames…drawer pulls and knobs.....I can go on and on J ????? So, as a thank you for your support I am giving away a $25 Hobby Lobby gift card to one lucky reader! These are all mandatory steps that together count as an entry. Last day to enter this giveaway is June 30, 2011. I will then use random.org to pick the winner! Again, thank you! You are all an inspiration to me J Here’s to two more years! Thanks for the giveaway! I follow your blog with Google Friend Connect. Congrats on the 1000 followers and 2 year anniversary! Congrats on your anniversary! 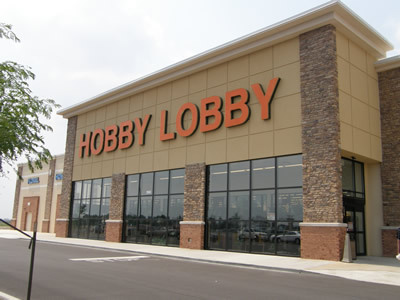 Your blog is fantastic...and as luck would have it, I live within walking distance of a Hobby Lobby! I couldn't sign in with my google account. AH! !I am a long time google friend! Yayyy, Giveaway! I LOVE HobbyLobby. I've been following your blog through an RSS feed...but I just made it 'public' through Google Friend Connect! I love what you do! I am a follower of your blog and I'm SUPER excited about this giveaway! I love Hobby Lobby! Thanks, you're great! I love following this blog, you inspire me! And $25 to Hobby Lobby would be SWEET! I follow you! Thanks for the great giveaway! I LOVE Hobby Lobby! Ours is 30 min away, but totally worth it! Oooooh...I am already a follower and a Hobby Lobby opened up last year right near my house. I seriously should receive my mail there. And congrats on the followers! I love that you are not caught up in numbers but your blog deserves 10,000 followers. You are amazing at everything you do! I'm a follower! Congrats on 1,000. That's great. Thanks for the chance to win. I love Hobby Lobby! Thanks for the awesome giveaway! I love Hobby Lobby! I am a follower and I'm leaving a post telling you your site is awesome!! I love following your blog, so cute! Thanks for the inspiration! I am a follower that fits all of your criteria. Count me in! I am a GFC follower and would love to win! I have been a follower for a while and check you every day. Love your blog. I'm a follower! I love Hobby Lobby. I'm a fairly new reader, and I love seeing all the inspiration! I am a follower and have been for about 6 months! I love your blog. Thanks for all you do! I've been a follower for some time now. Love the blog. And love Hobby Lobby!!! Thanks for the opportunity! I love me some Hob Lob! I really enjoy your blog! Keep the great ideas coming! I love you blog! you have such great ideas.. Thanks for sharing them! I would LOVE to win! Congrats on reaching such a huge milestone! THis would be great! love your blog! I love following your blog and I LOVE hobby lobby! Congrats on 1000 and 2 years! Yours is one of the first blogs I started following! I'm a follower and I LOVE Hobby Lobby! Yay, I LOVE Hobby Lobby!!! I would love to win - thanks so much for the great giveaway! Am I the ONLY one in the universe who has never been to that store?! Everyone in blogland is constantly talking about and I've never even seen one! I wonder if Oregon is one of the anti states? I follow your blog via Google Reader, and I love the inspiration. The Hob Lob care would be awesome to help decorate my daughter's dorm room this fall! Wahooo! There is one Hobby Lobby in MN!!! Common winner winner chicken dinner. I love Hobby Lobby! and I follow your blog. Hobby Lobby is so fun! It is the closest craft store to me so I visit it often. :-) Crossing my fingers! I follow your fabulous blog! Thanks for all the amazing inspiration, and a fun giveaway too! Congrats! Been a big fan and following for a while. I love HL!! I'll save you some time and go ahead and send you my address. *wink wink* Congrats on the 2 year anniversary! I am a follower of your blog. Love the giveaway! Pick me! Hooray for giveaway's! I love following your blog. You have such a talent for creating new fabulous designs! Count me in! Wonder what the people in those 11 states do for fun? :) I guess there's always the internet in a pinch. Hobby Lobby is one of my favorite stores. I can spend hours looking around in that store. Thanks for the giveaway. I guess Virginia is one of those 11 states. Bummer, but I wanted to comment regardless and tell you how much I love reading the blog! & the laundry room makeover is on my to-do list. It's gorgeous!! Thanks for the chance to win, maybe next time? & Congrats on 2 years!! I happily follow you! Congrats!! I love your blog and love Hobby Lobby and love this giveaway!! Crossing my big ol' fingers! Ahhh my absolute favorite store! :) I'm a follower...thanks for the chance to win! Thanks for the inspiration! Your ideas are so unique and at the same time very do-able for those of us with less time, space and talent! I'm so glad I found your blog! Love your blog, it's fantastic :) congratulations o. Yout 1000 followers and 2 year anniversary! I definitely could have used this last weekend when I ran in to get 1 thing...$100 later!! It was worth it. They have amazing sales! Thanks for the giveaway! I love Hobby Lobby. Congratulations on the 1000 followers and 2 year blogiversary. Love Hobby Lobby, I could live there! Great giveaway... who doesn't love Hobby Lobby! It was actually one of my childs first words, ha! Congratulations! I love your creativity - it gives me much inspiration. I would love to win a pretty gift card from Hobby Lobby. I was going shopping there after work but now I will keep my fingers crossed and hope I win and go next week instead! Thanks for the giveaway! I love Hobby Lobby and I am a follower! Your an inspiration to so many people! Keep doing your thing girl. I am a follower-what a great giveaway! Love your blog. It's given me such inspiration! Love your blog!! Great work! Thanks for the awesome giveaway!! Love the blog and I love Hobby Lobby. Good luck to whoever wins!! There is a Hobby Lobby about 15 minutes from my house, so I shop all the time. I could go crazy in there is the budget allowed. A gift card should would help! Congrats! I love love love your blog! I love your blog and will stay up late while my hubby sleeps to look through your cute ideas! I love Hobby Lobby. I sure hope I win. Thanks for the fun giveaway. I live in Utah but am originally from California. congratulations on 2 years blogging & 1000 followers! We JUST got a Hobby Lobby sort of local to us......I have done nothing but read all the good scores that designers are getting....I am in it to win it!!!! Thanks. I'm our newest follower! So glad I stumbled upon your blog! Thank you for your giveaway opportunity! I love your blog as I can always find affordable ways to spruce up our house:) thank you! Congrats on 1000 followers! Woohoo! I love Hobby Lobby. Thanks fro a giveaway. How awesome are you!?! Love Hobby Lobby and congrats on 1000 followers! Congratulations on 1000 followers! I am a follower of Thrifty and Chic on Google Friend Connect. Love Hobby Lobby!!! Oh oh oh , thank you for the giveaway! Pick me, pick me, pick me! Your Desk post is absolutely AMAZING. I now want to completely redo our office.... yikes! What talent you have. A few of your posts have blown me away! You are so creative! Glad I found your blog. I've been a follower since the beginning (or so it feels). You are amazing! Loving your blog! I've been following in Reader for about 6 months and I'm totally inspired by your Living Room makeover! Those built-in shelves are simply to.die.for! We are moving to a new house, so I could definitely use some decorating ideas! I just found your blog. You have some interesting ideas that will keep me inspired for a while. I look forward to following your posts. I'm a follower (didn't see a public link) but subscribed through google reader! Please enter me in the giveaway! Great blog! Keep those great ideas coming! I'm so excited! Found your site when looking for moulding ideas for my new lighting fixture. Just bought my FIRST HOME and am happy to see that others have blazed the DIY trail before me...so I can copy them! Thanks. That's so nice of you! I just found your blog from the tatertots and jello post on the tree stump coffee table - LOVE! Awesome blog...I really enjoy reading it! You've got so many great ideas. And who doesn't love Hobby Lobby?!? I read your blog religiously but in order to follow on google friend connect i have to have a website of my own??? my family would kill me if i took that on! ah well, the nearest hobby lobby is a 4 hour drive anyway! congrats on the anniversary and all us followers! keep up the great ideas! I am so excited that I found your blog through Better After, as I am just getting into the DIY projects in the home we bought a year ago! A Hobby Lobby Gift Card is awesome! I'm a new follower via GFC. I love your tree stump coffee table. I've wanted a tree stump side table for a while now, and my boyfriends aunt will be giving me a piece of cherry wood soon. I'm so excited. Wow, how generous! I am a new follower of your blog! I'm a US resident. I would love to win this so I can get some new frames to put some of our wedding pictures in! Yea!I'm new and love the blog. Maybe I can be 1002 or something. There's no telling what I'd use a HL gc for. The current project is sheet moss on big cardboard letters -so maybe more moss! hi; i am a new follower to your blog and i liked you on facebook. i have admired your works for quite awhile...esp love the tree log coffee table; just beautiful!!! thanks for having such great projects! Thank you, thank you for this giveaway, it's AWESOME!! HOORAY for reaching 1000 followers, what an accomplishment! I'm a follower! Thanks for the giveaway. I'm now blogging so check me out! Thanks for hosting this giveaway! I'm a new follower! I have done # 1 & 2, and I live in Georgia so I qualify. Thanks for the great giveaway. Just found your site -- looking forward to exploring! Now following via Google Connect, and live in GA. I'm a follower. Love your decoration tips! i am a new follower. i also love hobby lobby. yes i also have one in my state. I am following you on GFC. You have a great blog and thank you for the Hobby Lobby giveaway! I live in New York State. I just find this page. and I look foward to learn more tips. Thank you!